What makes a TEDDY BOY? The Making of Boy Gangsters . 20th Century Box - Rockabilly. 'Teddy Boy Style is back: it never went away' is an article that was written by Journalist, Alison Veness for 'The Independent' newspaper and was published in the Monday, 16 May 1994 edition. The article is about T.E.D.S. 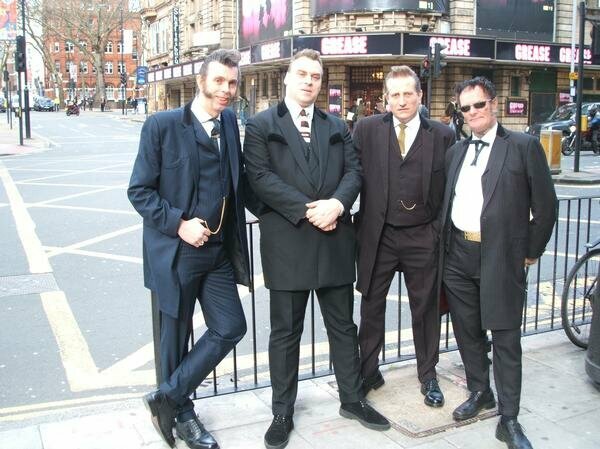 - The Edwardian Drape Society after her visit to the Tennessee Club in North London and discusses the move then towards the wearing of an authentic Teddy Boy style. A young looking Ritchie Gee (stood right) with Dixie (stood) and Suzy (seated) at Clapham in 1993. A highly varnished double bass is stuck to the wall and fading photographs of past musical sensations look down on the Tennessee Club. 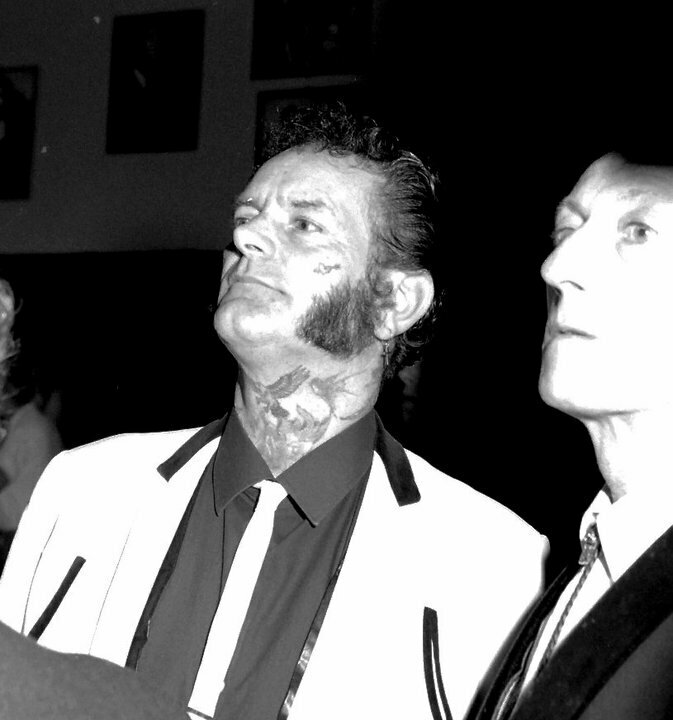 By 10.00 pm it's full of slick Teddy boys and Teddy girls, it could almost be way back in 1953. This is time travelling, going back to an era and style which for many is their life: a fixation. Teds have been coming together since the early Fifties, in the evenings and at the weekends, when they drive to Butlins and Pontins to see old favourites and new acts. They compare original press cuttings, swap vintage B-movies, the talk is of Billy Fury, Eddie Cochran and Elvis Presley, memories of Graceland, Nashville and Jerry Lee Lewis. Some recall fights on the beaches and talk with wonder about flick knives and knuckle dusters and they marvel at the rightness of it all. Those were the good days. But they talk darkly about the Seventies, the bad days when Showaddywaddy took the mickey, took their drape jackets and turned them into kitsch day-glo fun. They didn't play Showaddywaddy records; they burned them. Now, as fashion grinds back to Teddy-boy style - one of its perennial retro stops - Teds, or at least some dim evocation of their aura, will come back into the national consciousness: you saw it on the catwalks in Milan in March, you saw it in the drainpipes and quiffs at some of the London shows. You can see it now in the fashion magazines and by Autumn London will be full of it. It isn't authentic of course, not true to the faith in any way. As for the Teds themselves, they don't mind any more. Nothing can touch them now. Frank is 50 and among the cognoscenti, is classed and highly prized as an original Ted. His dancing partner is Mary from Kent, they have been jiving for the last 17 years, in fact he's been coming to this venue for 17 years, he's a bit of a celebrity. He isn't self-conscious about it, he's a complete natural. Frank has his drapes made by the Geach's, the tailors on the Harrow Road; they cost approximately pounds 250, however back in the 50s he remembers paying them off at just 50p a week. He is a member of The Edwardian Drape Society and owns 10 drape jackets, all 15 or 16 years old. 'Dark drapes, that's the thing - they were never bright and jokey,' he says. With his wide sideboards, slicked back hair and tattooed face he comes across as slightly mean. He closes his eyes, he's smiling, he can hear the music. Diana Maclean gets through a steady supply of wax. 'Yeah I have to wax it, it helps keep it up,' she says, running her hands through her quiff. Diana, 23, is meticulously dressed in a sharp red drape suit, made for her by the tailor Mark Powell. She is wearing a duck egg blue shirt which belonged to her father. She is carrying a choice of cufflinks and wearing a fistful of chunky silver rings. 'I'm not really into 50s music at all, although I suppose I might have a few film soundtracks, I listen to Radio 3,' she says. 'I don't think it matters if you are really into something or not, I don't want to wear a uniform. She doesn't much care what real old time Teds think about how she looks. Her clothes make her feel confident. 'Anyway I'm not out to be a Ted. Someone might say I'm a fashion victim, but it's my personal style, my interpretation.' 'I never feel self conscious, in fact it's nice bringing a smile to people's faces. A few people have commented that I look like Elvis but I'd never really thought about it. I do get mistaken for a boy but I quite like that, I find it interesting. In Japan if I was out with a girl they would say to her 'you've got a pretty boyfriend.' She runs her hands through her errant quiff. Diana refuses to be labelled: 'I've never even thought, oh I'm getting dressed up like a Ted, I do have other modes of dressing.' Tomorrow it might be a pair of jeans worn with her chocolate brown velvet, gold thread jacket. Whatever it is, it will look stylish not slavish. Dixie is dressed in a milky blue sweater, pedal pushers, her mouth a gorgeous gash of red lipstick. She is the manager of a doctor's practice. Fashion is catching up fast with Dixie. She has just spent the day with Italian Vogue, providing 'background' for a forthcoming fashion shoot. She buys her vintage clothes from Greenwich and Camden markets but she doesn't spend a fortune on them. She also buys pieces that look faintly Fifties from the High Street. Her sweater is from Benetton. Her heroine is Diana Dors and she adores Billy Fury. 'We went up to Blackpool for a Billy Fury weekend, it was a laugh, really nutty, Billy Fury quizzes, Billy Fury everything. She has been a Teddy-girl at heart ever since she was 13 and went to the Lyceum Ballroom with her sister, Sue. 'It was a Ted's night, it was brilliant I knew then that I wanted to be part of it. I learnt to jive. I love dancing, it's fun but you can't take it all too seriously,' she says. Ritchie is a purist.' This whole fashion revival makes me shudder, you never know what's going to come out of it. I mean look what happened in the seventies, it was terrible, we were just caricatured. Ritchie, 41, is immaculately dressed, wearing a pounds 350 black drape jacket, drainpipe trousers and waistcoat made for him, bespoke, by a tailor in Romford. His tie is all of half an inch wide, fastened with a neat tie pin. His arms are covered in fading tattoos, snakes and eagles predatorily circle a Ted and two spikey dragons are emblazoned around his waist. Ritchie is the founder of the Tennessee Club, which meets at the back of the White Hart on a Thursday night. His day job is carpet fitting, in the evenings and at the weekend, he chauffeurs people around in his 1976 Cadillac Seville. 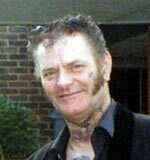 For 17 years he was a roadie with Crazy Caven & The Rhythm Rockers. 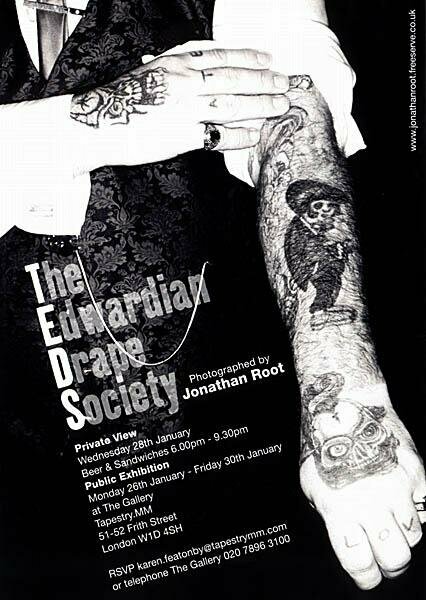 Ritchie is passionate about Teds and with his girlfriend, Dixie, they started The Edwardian Drape Society (TEDS,) the aim of which is to gather like minded Teds for exclusive evenings. A stringent dress code is enforced and membership is by invitation only. 'If we spot a nice looking Ted then we give him a letter, which says 'Are you depressed by the scene ? Then come along and meet but keep it a secret,' we don't want just anyone, they've got to dress right. He got into the scene in the early Sixties when he was at school. 'I used to go up to the Ace Cafe on the North Circular on my motorcycle, since then it's been a way of life. I love those first Elvis, Sun Sounds and Buddy Holly, Eddie Cochran, Hank Williams, the music really sends me I get a real buzz out of it. 'You've just got to see the crowd here, guitar breaks really get them going, you see rock 'n' roll songs have stories to them, take Teddy Boy Boogie 'Standing at the corner swinging my chain, along came a copper, took down my name,' see there's a reason why I'm wearing this fob,' he says twirling it around. Ritchie is a real stickler. 'I'm trying to educate people. There will always be hangers on, but that's it, they just hang. It will pass,' he sighs.